Wedding holds a special place Cretan life and tradition. It is still seen as a real mystery that ensures the continuity of family life. Wedding is one of the most important events in life. Cretan Church weddings are performed to Orthodox traditions which are in many ways different from weddings in other European countries. A wedding is organizationally a mega event for the families. Already 6 - 12 Months before the wedding the exact date and hour (church) is to be agreed with the priests and the so-called "Kentro" and the photographer for photos and video. The Kentro is a ballroom with a large stage and dance floor, with a large kitchen and sound and lighting system, which was built and furnished for the sole purpose of organizing events like weddings and baptisms and catering and entertaining 1000-3000 guests. The costs of an average wedding in the area of Rethymnon with 1,500 guests are about 18000-24000 Euros without musicians who are paid usually by the respective dancers through the throwing of bills (20, 50, or 100 euro bills). In Greece, on Crete, the priests are not paid by the state but at important celebrations paid by "the organizer". 3 or more present reciting and singing priest show evidence of the wealth of the couple. If the dates are finally determined, the period leading up to the wedding is filled with buying, sewing, making lace. The wedding dress has to be bought, sewn or rented. Only the rent for a wedding dress will cost more than 1,000 Euros. Expensive invitation cards are designed by graphic artists, ordered and distributed to the guests, usually by the couple or their parents. Each guest will be invited personally. He is allowed to bring his entire family, he must specify the number of "his" participants so that the number of seats and dishes can be planned. The small gifts "missiles" for the church will be bought in specialist shops for weddings and baptisms. In short, nobody involved can think of anything else anymore for months! A conference of members of both families, where - often in excited and very open form - the dowry of the bride is negotiated. Usually, the groom brings only the marriage bed and his ability to use it into the marriage. The bride receives from her parents a to the last spoon furnished house or a corresponding flat where the couple shall live. This house remains property of the bride, in order to secure her and her children in case of divorce. For fathers with two or more daughters this still current tradition is often the nightmare of their lives. The second stage is the engagement. The groom buys the engagement ring puts it on her finger in the presence of the priest at the engagement party. The groom's family decorates the bride and the bride's family decorates the groom with lots of valuable gold jewelry and other gifts. In the area around Rethymnon this is a real joyous celebration with music and dancing which takes place in a "small" circle (50 - 200 guests), in the villages either in front of the bride's house or in the village square, in the city in an appropriate restaurant. The third and most important stage is the traditional church wedding ceremony followed by the wedding celebration, which usually takes place on a Saturday or Sunday. On Thursday before the wedding the marriage bed is traditionally made three times by unmarried women (virgins) in the new home of the couple. The sheets and blankets are made of handmade lace, which are part of the dowry of the bride. The bed is covered with rose leaves, sugared almonds, presents and money which are placed on it by family and friends. In addition, a male baby is thrown on the bed as a symbol of fertility of the bride and the wish the first child to be a boy. An important role in the Cretan wedding plays the Kumbaros, Best Man, witness. He is often a friend of the couple. He is purchasing the large stand candles for the church, the sugared almonds, the little gifts which participants receive after the wedding ceremony, the sacramental wine and the entire flower decoration in the church. Sometimes he also pays the priests. He is the one crossing the crowns over the heads of the couple in ceremony. The groom waits at the church with a bouquet for his bride. In the old days she was brought to church on horseback by her father in a festive procession through the streets of the village with Cretan musicians with lyre, lute and singing. This tradition is sometimes still alive in Rethymnon. Mostly the bride is brought to church at the top of a deafening honking motorcade in a beautiful decorated car. In front of the church she is given from her father of the groom, and the wedding ceremony begins. The wedding ceremony in the church is always an impressive event. Whether the church is large or small, located in the center of town or the village square, a romantic situated monastery or a chapel carved into the rock, approximately 20 - 30 percent of the invited guests come to the church wedding and gather in or around the church. The men are dressed quite decent, the women and girls showing their best new clothes. Even in rural terrain, high heels and stiletto heels are worth seeing. Initially each faithful Christian enters the church once, buys and lights a candle and kisses the icon of a saint. Then follows the traditional ceremony by Orthodox custom. It is prayed, sang, recited and repeatedly delivered the creed. Everybody is focused on the bride and groom and the Koumbaros. The bible is three times presented to the bride and groom while the priest chants prayers in ancient Greek. The couple will kiss the bible when it is presented. The rings are placed on the bible and the priest places them on the right hand of the bride and groom. The crowns form a very important part of the ceremony as the ribbons that join the couple symbolize the joining together of two lives. 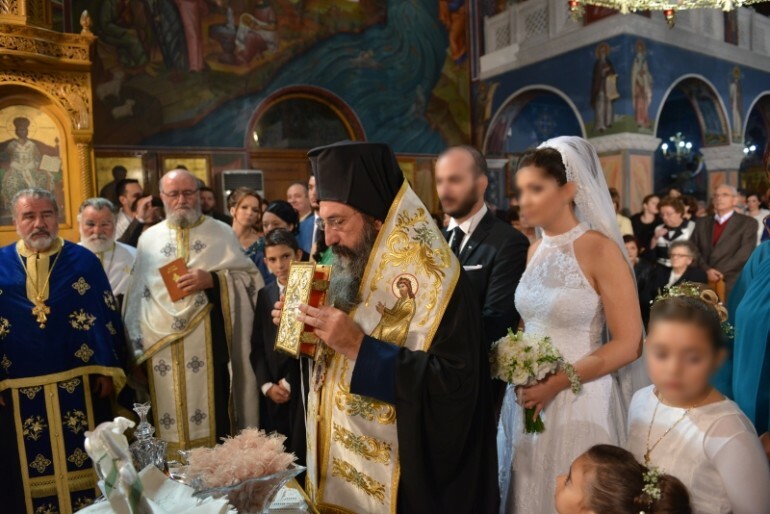 They are crossed over the heads of the bride and the groom by the Koumbaros and the couple then walks around the altar with the priest three times while the congregation showers them with rice. The chalice of wine is given to the couple by the Koumbaros and they must each take three sips from it. After completion of the actual ceremony the priests retire and congratulating the couple begins. Now everyone is pushing from inside and outside through to the bridal couple to congratulate them, of course the families come first, who decorate the couple again with gold jewelry. Next to the couple stands the Kumbaros, beside him or her a relative with a plate of sugared almonds and next another relative with a hand-woven Cretan bag and a tray on which each congratulator puts the wedding gift, a small envelope with congratulations and money, today usually between 30 and 50 Euro per person who later participates in the celebration. Close friends and relatives give more. The guest takes an offered sugared almond. Those who do not come to the church, but immediately go to the Kentro will deliver their gifts later there. An amount of forty- to sixty thousand euros may be collected at 1,500 guests. In this way, the newlyweds finance the wedding celebration and after also have the money for purchases or a honeymoon. The point of this custom to give Cash gifts is to facilitate the couple a good start into a happy life together. Before leaving the church each participant receives a small gift and a candy. Outside in front of the church are the parents and siblings of the couple waiting, who are also congratulated. Afterwards the couple signs the civil marriage contract in front of the priest. Everything is photographed and recorded on video. After the wedding ceremony, everybody except the bride and groom moves to the Kentro or go to the village square. There the merry wedding party takes place. You can enjoy good food, music and dancing there. The couple goes first to the photographer’s studio for portrait images in wedding dress. In the Kentro you are looking around for a good place and then look, who else you know is there. The tables of the newlyweds, the families of the bride and groom and the Koumbaros and his family along with close friends, the best places so to say, are of course closed to the normal wedding guests. But the Kentro-ballrooms are all designed in a way so that the dance floor where the action will be is well visible from all seats. The food at such a wedding reception is good, plentiful and traditional: One usually sits at long tables. There are initially cold appetizers, fried liver and other offal, tzatziki, potato salad, baked filled pasties and Cretan gruyere cheese and lamb yogurt with Cretan honey. Afterwards a warm goulash-like appetizer is served. Then the traditional Pilafi, rice cooked in the gravy of cooked lamb usually together with cold cooked lamb is served as first main course. Then fresh salad and oven-roasted lamb with baked potatoes is served as a second main course, and then fruits are finally cake. The bride and groom usually appear under great applause after the hot Pilafi has been served - even for 1,500 guests in minutes – to the guests, about one to one and a half hours after the arrival of the wedding guests. The new spouses go together with the Koumbaros on the dance floor and drink with further applause a glass of champagne, kiss each other in front of the audience and feed each other with a piece of cake. Then the couple dances alone a waltz or to the music of a slow modern hit some rounds with further big applause. The 5-man band will play a traditional Cretan wedding song, greet the couple, the Koumbaros and the guests and ask the guests to the dance floor for congratulating the couple. All those guests who were not present at the wedding ceremony in the church, storm on the dance floor to congratulate and leave their wedding gifts. Then after a pause follows the performance of the traditional bridal dance. After the Koumbaros, the families of the bride and groom, the guests are requested in groups by the band for dancing. The bridal dance is a Cretan round dance with the bride and always new alternating groups. Every dancer, every dancer throws the tape to a bill. The bride dance can last for hours. Meanwhile the crowds eat watches and when in the often deafening volume of the music possible, talk. This dancing drinking and eating continues happily until the next morning. Of course uncounted photos and a video recording is taken by professionals.